BANFF, Alta.–There should be a law against blogging at Banff. It is just too damn beautiful outside. Everywhere you look is a picture postcard. 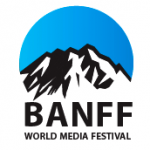 So let’s run through Monday’s Banff World Media Festival experience as quickly as possible. I moderated two sessions. 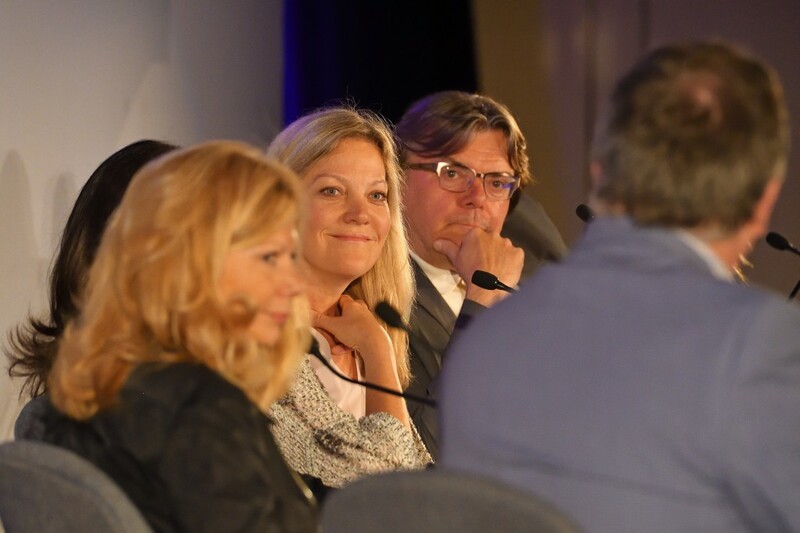 The first was called, “The Future of Canadian Content” and the Alberta room was packed. Seems people really believe a) there is a future, and b) any of us have a clue what it will look like. Pretty smart group on stage though: Colette Watson, VP television and broadcast operations, for Rogers; Randy Lennox, president, entertainment production and broadcasting, for Bell; Jocelyn Hamilton president, Canada, for entertainment One; Sally Catto, GM programming, CBC and Maria Hale, SVP Global entertainment and acquisitions. Usually these TV execs tell ya nothing up there. They don’t want to spill any secrets. It would be like a hockey coach telling a press conference exactly where their star player is injured. These folks were fairly candid, though. Watson wondered out loud if we really do need the same old credit and funding system, a question raised recently by two Canadian think tanks. Watson wondered why a series like Man Seeking Woman, an FXX series shot in Toronto, starring a Canadian (Jay Baruchel) and produced by 100 Canadian crew members qualifies for zilch Canadian content brownie points. Rogers and FX are in business together, of course, but Watson, I think, has a point. Other FX shows such as Calgary’s Fargo and Toronto’s The Strain do employ plenty of Canadian showmakers–just no showrunners. If suggesting a looser interpretation of what counts as Canadian sounds like heresy (as I’m sure it does to several Guild members), the one thing that seems to keep emerging from Banff is that Canada simply can’t go it alone much longer in the TV game. 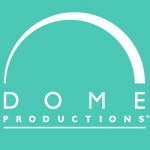 This really has become a borderless business, whether you’re a writer, an actor, a buyer or a viewers. We talked, therefore, about international co-productions. We flipped it and also talked about little homegrown digital hits such as Letterkenny. We even used the “N” word–Netflix. Bell, through Discovery, has teamed with Netflix on the shot-in-St. John’s historical drama Frontiers. Rogers, through City, is in bed with Netflix on Between, the Don Carmody-produced sci-fi series returning in a week or so for a second season. There’s no simple answer to why they’re “sleeping with the frenemy,” as Lennox put it. Frontier is a big show and commands a big budget, and Netflix does pay real money. Frontier would not be the show it needs to be without that deal. There is something about putting your show out there internationally in front of 81 million people, too. I asked about the chase for the new CBS digital Star Trek but nobody showed their cards. Engage! The speakers all seemed to ditch their usual speaking points, however, which led to a lively exchange. Hats off to all of them for even showing up. 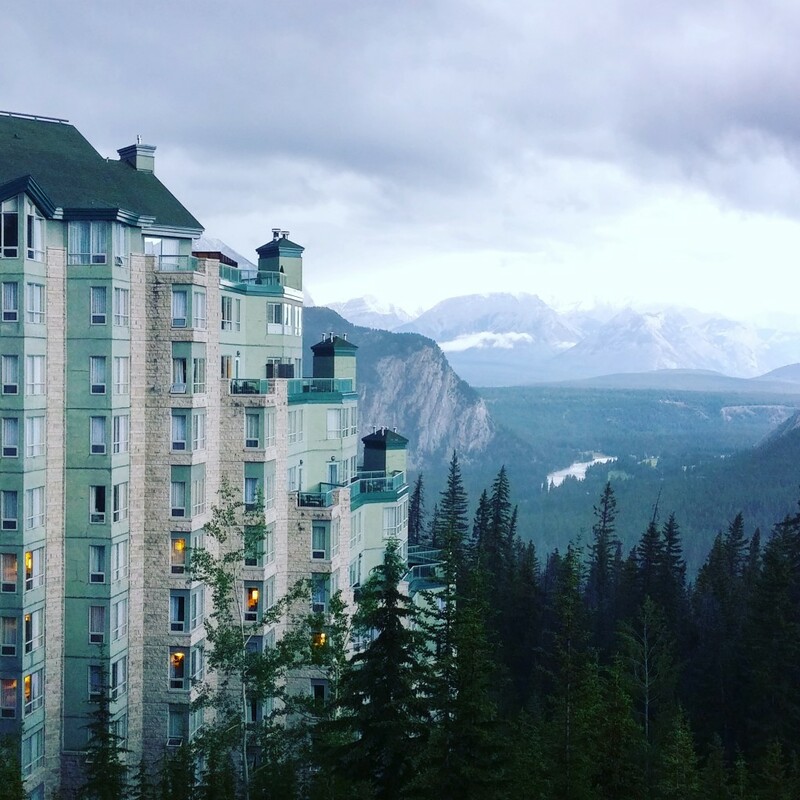 Banff comes hard on the heels of the upfronts, which come right after the Hollywood screenings. These execs have just run a marathon and dragging them to Banff is like adding another 12 laps. What brings them here then? You just have to look outside. 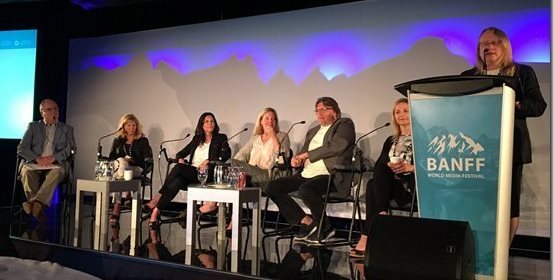 For more on the “Future of Canadian Content” Banff session, check out this article by Katie Bailey in Playback. I think Canadian shows do best internationally when they don’t shy away from their Canadianess. There’s nothing that annoys me more than when Cancon dollars go to telling American stories set in America. The setting of a show can set it apart. Something I really like about Netflix is that it embraces international scripted shows. I love Bollywood movies and there’s plenty on Netflix, as well as several British series, South Korean series and films from several different countries. Netflix gives us access to international film and television and its marvelous.